Thanksgiving may be the holiday that most celebrates home cooks, and we'd love to see how you pull it all together! So, we present the Thanksgiving Photo Challenge. To participate, tell the story of your Thanksgiving through pictures of the experience. They can be of anything -- the food, the people, the table, the details. Choose your 10 best (include captions if you'd like), and send them to [email protected] by 6PM EST on Sunday, November 29. We'll look through them all, choose our three favorite collections, and post them as slideshows to the site. 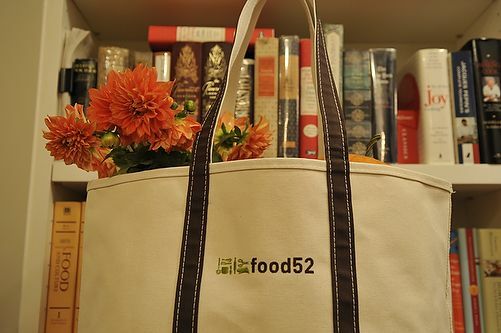 We'll then open up the comments for votes on everyone's favorite, and the winner will receive a food52 tote bag. We can't wait to see your Thanksgivings! *Before submitting photos, be sure to tell your friends and family that they may appear in your slideshow. What size should the photos be? Not huge, but doesn't matter so much because we can re-size them. We wrote a little narrative for ours -- is there a way to have that run with the photos or should we reduce it to captions instead? You can have an introductory narrative and then captions would be best -- they can be a few lines long. I should have said -- brief intro narrative -- but would be great if you could squeeze it all in the captions. This is a great idea- Thanksgiving is really more an experience than a meal, and this is a way for us to share our varied experiences with one another! I love this idea. It's a great way to get me to focus on noticing the beautiful moments this holiday rather than just focus on the crazy cooking moments. Plus, what else do I do with Thanksgiving photos? Now a fun way to share them with others who take equal pride in their holidays celebrations. We agree -- looking forward to seeing yours! Whoa--this could be really good and really revealing! It'll be a scramble in our house! Can't wait to see the entries! How fun! I'd like to submit but it would be from Canadian Thanksgiving (early October). Is that okay?